This IT solutions provider is projecting to double its sales revenue growth this year by acting quickly after Hurricane Sandy. Wittstein believes he has about two more months to reach out to customers and prospects who don’t currently have a backup and business continuity solution and to persuade them to consider putting a disaster recovery plan in place. “I predict that just like in years past there will be a spike in backup and business continuity sales, and then the interest will die down again,” he says. One of the other factors that helps Wittstein sell Datto’s BDR solution is that he uses Datto to back up his own data center. The fact that Datto’s cloud data center has built-in bicoastal redundancy and is SSAE 16 (statement on standards for attestation engagements)-compliant gives Wittstein assurance that his mission-critical data will remain safe under even the worstcase scenarios. Alan Wittstein has been in the IT solutions business for more than 16 years, and he’s seen his share of changes during that time. One thing that’s remained constant over the years, however, is many business owners’ aversion to preparing for the worst case scenario — server failures, fires, power outages, floods, and other natural disasters. 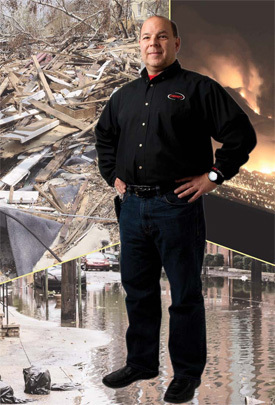 Nonetheless, Wittstein, who’s the president of CONNECT Computer, makes disaster preparedness conversations a top priority when meeting with customers or speaking with new prospects. A third factor in CONNECT Computer’s projected revenue growth this year is the BYOD (bring your own device) trend. Through its partnerships with SonicWALL and Ruckus Wireless, CONNECT Computer is holding technology breakfasts to address its clients’ BYOD concerns. Wittstein is seeing a growing interest in this topic especially among municipalities and K-12 customers. In 2013, he anticipates 20% of his revenue will come from selling Internet security applications, firewalls, and wireless security solutions. Of all the trends Wittstein’s been seeing, however, the one he believes will be the biggest contributor to his revenue growth this year is the increased interest in backup and server recovery. “We believe this could make up to 30% of our revenue this year,” he says. And he doesn’t believe this is a short trend either. BDR (backup disaster recovery) technology has matured over the past few years, causing the price and complexity of operating a BDR to come down while at the same time the functionality has gone up. “BDR used to require a team of IT professionals to perform a recovery over a two-day period,” says Wittstein. “Nowadays, it’s almost as simple as pointing and clicking — in many cases the end user can initiate a restore in less than a minute.” Even though Wittstein sees big growth potential in DR and BC sales, he’s quick to point out that BDR products aren’t flying off the shelves like iPhones and iPads. Selling this technology doesn’t provide an ROI like other business IT solutions either. It’s more like buying insurance. It only reveals its value when things don’t go as planned. Wittstein has a motto he follows that helps him put selling DR/BC products and services in perspective: “It’s not about selling a product, it’s about the process.” To that end, he follows a four-step process when engaging clients on this topic. Step 1: Free Consultation. The idea of giving anything away for free is a risk for any business. But in CONNECT Computer’s case, it’s a gamble the company believes is well worth it in the long run. More than any other IT solution, Wittstein finds that selling DR/BC solutions and other cloud-based offerings requires a consultative approach. He provides an initial free consultation that can require as many as two employees to spend from two hours to an entire day, depending on the number of sites, systems, and applications. Wittstein goes on most of the sales calls, and he usually brings his top sales engineer/systems architect. “We invest this time up front because DR planning and implementation has to be a partnership between us and the customer; it doesn’t work any other way,” he says. “This isn’t the type of solution where you can take a cookie cutter approach and sell the same bundled solution to everyone. You need to know how their business processes work, including how they make money, and where they lose money.” In some cases, a customer’s biggest issue may be that it needs to maintain their just-in-time ordering of parts and supplies. This could entail providing a couple of employees with instant failover to ERP (enterprise resource planning) and MRP (material requirements planning) software to make sure product orders continue shipping on time. Even if the manufacturing plant is shut down for a couple of days, you don’t want the rest of the supply chain process to shut down. The customer still needs to see what’s in transit. Step 2: The Customer’s Choices. All this information goes into CONNECT Computer’s risk assessment. At the end of the consultation period, Wittstein does not provide any deliverables. At that point, the prospect has a few choices to make. Some may choose to do nothing. In that case, CONNECT Computer is out the time it invested. More than 80% of the time, however, prospects choose one of two other choices. “One option is for us to provide them with a written assessment of our findings,” he says. “This is important because it gives us an opportunity to show clients we were listening during our meeting and we’re addressing their business needs,” says Wittstein. “In some cases, the customer may want a very detailed write-up, which becomes a paid service, where the client ends up owning the data in the end, and can even take the write-up to another IT solutions provider to ask for a bid. Another option they could choose is to have us provide them with a proposal to solve their business vulnerability problem(s).” If the latter is the case, CONNECT Computer could waive the fee for the write-up, if the prospect decides to use CONNECT Computer. Wittstein has never been in a situation yet where he’s completed a risk assessment and the prospect hasn’t asked him for a proposal. In many cases, however, the client may not have the budget to roll out a complete DR and BC solution, so CONNECT Computer helps the client prioritize the most to least urgent issues. “One of the most important truths we help them discover during the assessment and decision-making process is the difference in value between a $500 tape library that takes days to restore after a server failure compared with a $2,000 BDR that can reduce your downtime to five minutes,” he says. Step 4: Documentation And Testing. After developing a DR/BC plan, the process is not complete until two things happen. First, a thorough and complete documentation package has to be compiled along with procedures. The package must be maintained as the customer’s business grows and/or changes — including information on insurance policies, access control, utility and security services, employees, and a host of other HR-related items. For example, where does the employee report to if the main office is off-line? Second, a DR/BC plan isn’t complete until it is tested. A full test of all DR/BC systems should be planned for and implemented initially, and no less than annually thereafter. Some companies, especially where there are regulatory issues, also do an “unannounced” test to make sure the staff can really follow the procedures laid out and their DR/BC partner can perform as expected. This is a contracted and billed service for CONNECT Computer.